Superior Spider-Man's Stegman: Amazing Spider-Man #700 is "Just the Tip of the Iceberg"
Ryan Stegman, one of the artists rotating on the upcoming Superior Spider-Man for Marvel NOW! 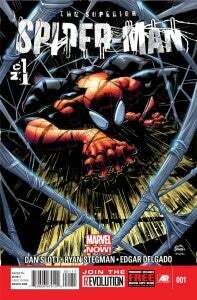 and the first artist who will tackle the reinvented wall-crawler, said in an interview today that the events of yesterday's status quo-shattering Amazing Spider-Man #700 are "just the tip of the iceberg" and that what series writer Dan Slott has planned for Otto Octavius coming up is "epic" and "amazing." Okay, so maybe that last one wasn't the best word choice. "We were at C2E2 this past year when we went out for pizza and [Slott] laid it all out for me," Stegman told Comic Book Movie. "I felt like I was in a secret CIA meeting. Dan was actually very open about it, he didn't seem to be too concerned about anyone finding anything out. But at the time, nobody would have known how big what he was cooking up would be. When he finished telling me EVERYTHING, because you see, ASM 700 is just the tip of the iceberg, I basically said, 'Holy s--t. That's amazing.' I couldn't believe I was being given the opportunity to work on something so epic." He added, for the fans not yet sold on the concept, "Here's the truth: You have no idea what's coming. So you can complain and scream and say you're not going to pick it up, but if you don't you're going to regret it. Also, I drew it super awesome. So why not buy it, y'know?" Superior Spider-Man #1 will be on the stands January 9, 2013.